This A3 LED light box is a new version of traditional drawing pad which goes with a USB cable and stepless adjusting brightness. 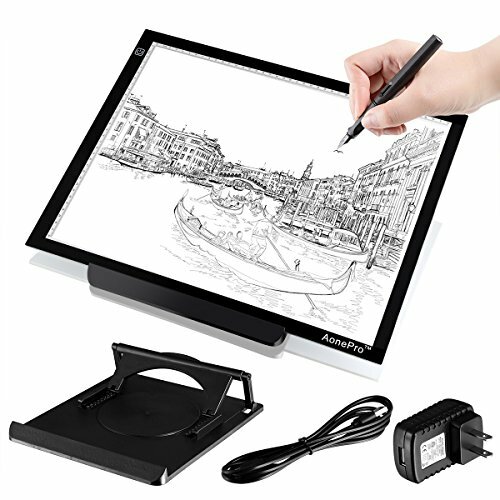 It allows to plug it into computer, wall charger or power bank, people can draw any time any where with this portable features. - Easy on/off touch button. - Dimmable, stepless adjustable brightness. - energy saving, low heat, long lasting. - BONUS Complete Accessories Kit: Power Adapter, USB Cable and Table stand. USB Cable Length: 59"(150cm) approx. PORTABLE & CONVENIENT: A3 Size (17" x 13") LED Tracing Light Box is only 0.3 inch in thickness. It is easy to carry around and no worry about the power supply, because it works with power banks. USB CABLE POWERED DESIGN - Just With standard mini USB phone cable (Android), it can access to any USB port like computer, USB adapter or even power bank. ADJUSTABLE BRIGHTNESS: Feturing Step-less touch button to adjust the brightness, just by long pressing it for result. Brightness from Min 450 cd/m2 to Max 3000 cd /m2, at daylight color 6500K, which provides comfortable light source for drawing. Thus this A3 Acrylic drawing pad built-in mutiple flicker free led lamps has various benefits, low heat avoids getting a hand burn, LED 52,000 hours lifespan lasts longer, non-flicker light comes to no harm for eyes. WIDELY APPLICAPABLE: LED tracing board A must have tool for artists, designers to do Stenciling, Sketching, Animation, Drawing, Calligraphy, Embossing, Scrapbooking, Tattoo transferring, Quilting 2D Animation, Sewing projects, Stained glass, X-ray film viewing etc. BONUS CERTIFIED ACCESSORIES & WARRANTY: Including US standard Power Adapter, Mini USB powered cable, Adjustable Light box Table Stand, Plus 100% Money Back Guarantee. If you have any questions about this product by AonePro, contact us by completing and submitting the form below. If you are looking for a specif part number, please include it with your message.